Is there a better feeling than smelling something freshly baking while you are warm and cozy in your home? We don’t think so. So, while the temperatures drop outside and the holidays loom on the horizon, we’re encouraging you to stay inside and bake, bake, bake! 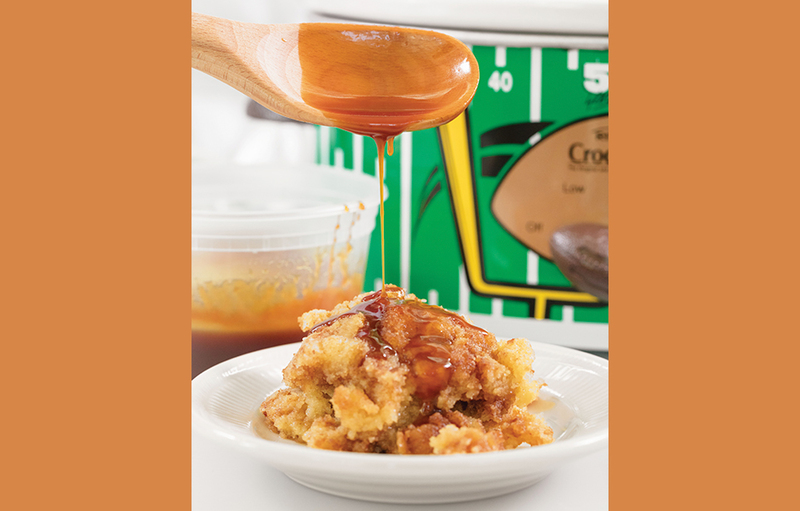 Start with this delicious recipe from Christina Tosi’s All About Cake cookbook: Apple Cider Donut Crock-Pot Pudding (recipe is also listed below). While you whip it together (and let it bake in the crock-pot), we curated a few audiobooks that you can listen to. Each of these delightful listens will last as long as it takes you to get from start to the very tasty finish. This Nick Hornby book is classic (who else loved John Cusack in the film version of High Fidelity?). So whether you know it, or are coming to it for the first time, the story of record store owner Rob searching for love and happiness is one that will keep you listening throughout your day of baking. This young adult story is perfect for adults who love a sparkling and fun love story. As a self-proclaimed Bollywood expert, Winnie knows that her boyfriend cheating on her is not how her perfect ending is scripted, but their relationship was written in the stars. When she starts falling for her friend, Dev, he challenges her to look beyond her horoscope and choose a life she really wants. Actress Parker Posey is a delightful companion to keep you company in the kitchen as you bake. Full of personal stories, whimsical how-tos, and recipes, her intimate and hilarious memoir will take you through her memorable career and personal life. For more listening suggestions to keep you company in the kitchen, browse this collection. Though in my book this is still very much a Crock-Pot cake, this recipe is technically more like a bread pudding . . . one that you will never be able to stop eating. It’s a love letter to fall in NYC and all the weekends I beg my handsome husband to go apple picking with me. Apple picking is just an excuse for a road trip with unlimited amounts of apple cider and donuts. So call this my excuse for something to do with all the delicious leftovers. 1. Plug in a 4- to 6-quart Crock-Pot. Grease the interior with pan spray. 2. Break up the donuts into bite-size pieces, about the size of walnuts, and place them in the Crock-Pot. 3. Whisk the sugar, vanilla extract, salt, whole eggs, and egg yolks together in a large bowl. Stream in the milk, apple cider, and heavy cream and whisk to combine. 4. Pour the milk and egg mixture into the Crock-Pot, covering the donuts with the liquid. Use a spatula or wooden spoon to stir everything. Cover the Crock-Pot and let it sit without turning it on for 30 minutes, so the donuts can soak up all of the liquid. 5. Stir the donut mixture again, then set the Crock-Pot to low. Partially cover the CrockPot and cook the pudding for 4 to 6 hours, until it has set and is cooked through in the center. 6. 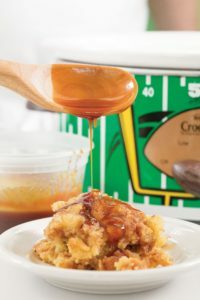 While it’s still hot, spoon the pudding directly from the Crock-Pot onto plates and drizzle each scoop with the apple cider caramel. 1. Combine the apple cider, butter, vanilla extract, and salt in a bowl and set aside. 2. Make a dry caramel: Heat the sugar in a medium heavy-bottomed saucepan over medium-high heat. As soon as the sugar starts to melt, use a heatproof spatula to move it constantly around the pan—you want it all to melt and caramelize evenly. Cook and stir, cook and stir, until the caramel is a deep, dark amber, 3 to 5 minutes from when the sugar starts to melt. 3. Once the caramel has reached the target color, remove the saucepan from the heat. Very slowly and very carefully, pour in the heavy cream. The caramel will bubble up and steam; stand away until the steam dissipates. Use the heatproof spatula to stir the mixture together. 4. Carefully stream in the apple cider mixture and stir it all together. If it is at all lumpy or if there are any clumps of hardened caramel floating around the sauce, put the saucepan back over medium heat and heat the mixture, stirring constantly, until the mixture is smooth. 5. Let the caramel cool before using. It will keep in the refrigerator, in an airtight container, for up to 2 weeks. Reprinted from All About Cake by Christina Tosi with Courtney McBroom. Copyright © 2018 by MomoMilk, LLC. Photographs copyright © 2018 by Gabriele Stabile. Published by Clarkson Potter/Publishers, an imprint of Penguin Random House LLC. Interested in more recipes to try this season? Try Cranberry and Brie Pull Apart Bread!